After we arrived at the expansive field on the outskirts of Cooperstown, N.Y., that smoldering Sunday in July 2001 for Kirby Puckett’s Hall of Fame induction, Tim, Shari and I needed to visit the port-a-potties, all blue, lined in a row by the road. We joined one of the dozens of human anaconda lines packed with tomorrow’s sunburn victims. A man walking past the toilets noticed a vacant kiosk. He opened the door and hesitated, then peered back at us. We must have looked like an eager, giant bladder. Is it line-jumping if hundreds of other people are too dumb to know a toilet is vacant? Tony Oliva and Rod Carew on Camera Day at Metropolitan Stadium, 1968. Everyone laughed, just as I noticed 1964 Rookie of the Year Tony Oliva in a biffy line. I said the former Minnesota Twins’ outfielder shouldn’t be in line for a whiz with us commoners. I know my place. “That’s just not right,” Tim agreed. Presently, someone in that line recognized Tony O — lots of Twins’ fans around for cuddly Kirby’s induction — and ushered the three-time American League batting champion to the front of the line. Those outhouses serve here as an allegory. Or metaphor. Or foreshadowing. I never could keep those literary devices straight. Anyway, those outhouses are the Hall of Fame and Tony Oliva — who turns 81 on Mom’s July 20 birthday this year — is standing outside. But Harold Baines is in. Making this literary device even more apt. Swishpan back to 1965. Swishpan. That’s the film method that introduced a new scene in “The Man from U.N.C.L.E.” on TV in the days of the NBC Peacock. The local, big city boys knew the ropes that day in June 1965. The 11-year-old didn’t. It was his first Major League Baseball game. He decided there was no chance a small-town kid from Minnesota’s Red River Valley could wrangle an autograph in that crowd outside Metropolitan Stadium in Bloomington, Minn.
A half-century-old bat signed by Tony Oliva serves as a surrogate for his spot in the Hall of Fame. And it doesn’t serve very well. Baseball’s biggest promotion at the height of the Vietnam era was Bat Day. Teams handed out 30-inch wood bats to youngsters as they entered the stadium with their parents. Kids would use the shiny ash with the deep-grained yellow barrel the minute they hit the front yard. Walking to the Pontiac Tempest with his family after the game, the kid glanced up and saw the big man walking in the parking lot where the largest mall in America now stands. The man wore a light blue knit golf shirt and black slacks. He was Cuban: Dabbed with dark ink, something the boy didn’t see in his small Midwestern town. This was not just any big-league baseball player walking alone to his car. It was Tony Oliva, the 26-year-old reigning American League Rookie of the Year, reigning league batting champion. “Ask him for his autograph,” his father said. It was a rare bolt of luck. He carried the ash toward the man. “Will you sign my bat?” The man’s smile revealed a gold tooth in front and a few English words escaped his mouth. He seemed to suggest his fountain pen might not be the best tool for the job. No ubiquitous felt-tip Sharpies back in those days. Oliva signed. In blue ink. With a fountain pen. Tony Oliva was a nice man. 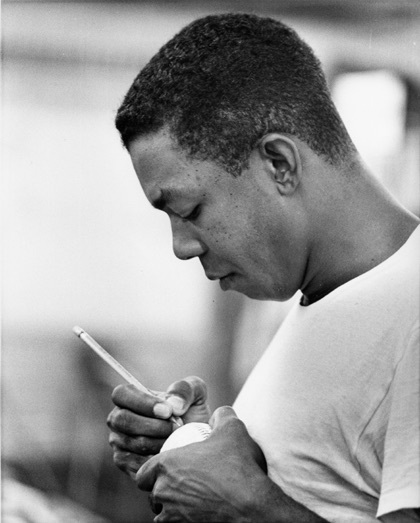 Tony Oliva signs an autograph in the Metropolitan Stadium clubhouse in the 1960s. The bat was never used. It leaned against the bedroom wall in his parents’ home until college days arrived, followed by sportswriting. That job was entrée to Tony Oliva’s world. Time had turned the Rookie of the Year into a coach, and sometimes the former kid found himself leaning against a batting cage with him before a game. Had Tony Oliva been born just a few years later, he would have played when sophisticated surgery replaced a complete knee filet and the accompanying insult. That would have kept injuries from prematurely foreclosing his career. Before thumb surgery, shoulder surgery and seven — seven — knee surgeries, Oliva was a gazelle in right field, a baseball maestro who could hit and run and field and throw. He was a thinking man in the batter’s box, maybe one of the 10 best curveball hitters to wear a big-league uniform and probably the best all-around player in the history of the Minnesota Twins. At the ballpark, at funerals, at celebrations and the horse track, Oliva was always natural and polite, just a regular person. It had been painful to live and play ball during a time when politics kept him from his parents, brothers and sisters back home, but Tony Oliva succeeded. The years slipped by. The autograph faded. To correct that, one day the bat traveled to an event where ballplayers signed autographs. After an hour’s wait in a line thick with electric kids, Oliva held the bat. “Will you sign right under the spot here, where you signed my bat in ’65?” The strong, long, slender fingers cradled the bat, and the ex-ballplayer verified where the man wanted it signed. Then he scripted his name. Very deliberately, and added, #6. Tony Oliva was still a nice man. There were big names at the event. A Hall of Famer. A future Hall of Famer. Should he add those signatures to the bat? He decided that maybe Hall of Fame isn’t good enough for a great ballplayer who thrilled thousands with his stylish play, who smiled and signed an autograph for some kid in a parking lot in 1965. Adulterers, drunks, liars and bigots are immortalized in Cooperstown. Oliva deserved an honor, a small monument to a decent man who baseball played well. There would be no more signatures on this bat. He put the bat in a display case, uncertain what a Hall of Famer should be, but knowing that Tony Oliva is quite enough. Tony Oliva has probably posed for a photo with everyone in the Upper Midwest. That includes my wife, Claudia Daniels. Tony was a force that year. Great article Jim, i was shocked to see Harold Baines get in. No disrespect meant towards Harold, but I thimk even he would tell you Tony O needs to be put in.